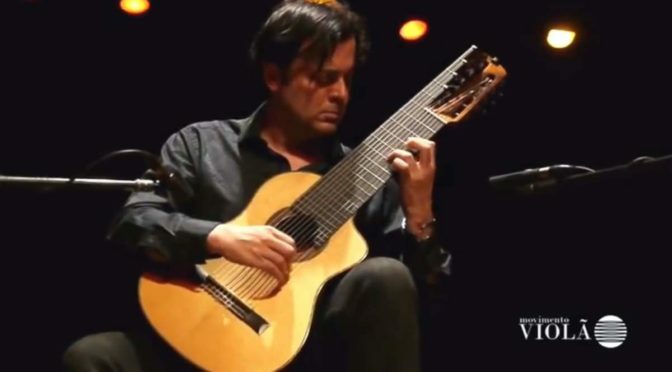 Brazilian classical guitarist Paulo Martelli plays Bach: Allemande and Sarabande from French Suite No. 1 in D minor, BWV 812 and Gigue from Cello Suite No. 2 in D minor, BWV 1008. Recorded live at Teatro Minaz on October 23, 2012 for Movimento Violão Guitar Series. Martelli’s guitar made by Samuel Carvalho, the Brazilian master guitar builder in 2004. The French Suites, BWV 812–817, are six suites which Johann Sebastian Bach wrote for the clavier (harpsichord or clavichord) between the years of 1722 and 1725. Although Suites 1–4 are typically dated to 1722, it is possible that the first was written somewhat earlier. The suites were later given the name ‘French’ (first recorded usage by Friedrich Wilhelm Marpurg in 1762). Likewise, the English Suites received a later appellation. The six Cello Suites, BWV 1007 to 1012, are suites for unaccompanied cello by Johann Sebastian Bach. They are some of the most frequently performed and recognizable solo compositions ever written for cello. Bach most likely composed them during the period 1717–23, when he served as a Kapellmeister in Köthen.